Officer responded to aid with a male patient on Lee Street. He was taken by squad to the hospital. A woman came to the department regarding a domestic dispute at her residence. Officer spoke to two Park Avenue Elementary students about a situation, and provided them with suggestions as to how to proceed. A motorist stopped in traffic at West Union and North Main streets had another vehicle back into it, causing damage. Officer assisted Ohio Highway Patrol trooper with a traffic stop in Edison. A probable cause search located medication that was not a controlled substance. The medication was returned to the prescribed party. A woman was being disorderly at Family Dollar on West Marion Road. When an officer arrived she was uncooperative and rude. She was told she was trespassed from the store and she will be arrested if she returns. A woman was cited for driving under suspension, booster seat violation and right side of the roadway. Officer assisted Morrow County Sheriff’s deputy with a domestic dispute possibly involving a firearm on Ohio 61 and Road 40. The caller had a bite mark on his right forearm that he said was done by his girlfriend. She was highly intoxicated and incoherent and refused to identify herself. She was arrested for domestic violence. 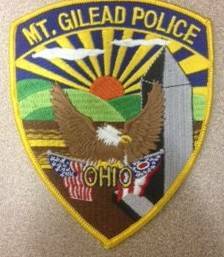 A man was arrested on a warrant out of Mount Gilead mayor’s court. A woman on South Delaware Street reported finding five tablets by her door. She took them to a pharmacy and was told they were morphine. She was concerned that someone was trying to harm her dog. The pills were taken and disposed of properly. The one-way sign at the intersection of Vine and East High streets was struck and damaged. The sign will need replaced by the village. A woman walking along East Marion Street appeared intoxicated. She then said she had been sexually assaulted in Powell the previous day. She was transported to the hospital. Powell Police Department was notified.